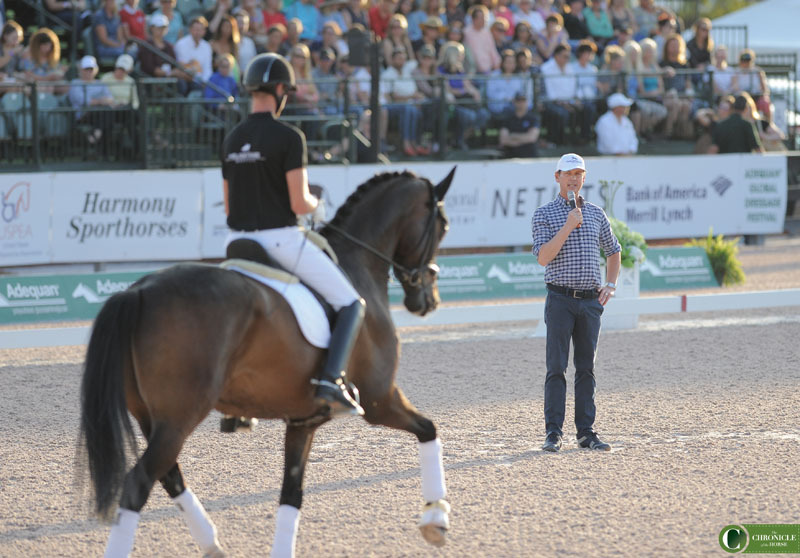 The audience at the Adequan Global Dressage Festival showgrounds on Wednesday night got a two-for-one bargain when they bought tickets for a masterclass with Carl Hester. Sure, they got to watch the British gold medalist teach six different horse-and-rider pairs at six different levels in the sport, from a 5-year-old all the way up to a Grand Prix horse. They got to hear Hester talk about training world record holders and gold medalists Valegro and Charlotte Dujardin. But that’s all to be expected from an event with this title. The bonus the audience received was plenty of comic relief from the famously hilarious Hester. “You think about one of these really big shows, the warm-ups are fairly quiet, and then you go through these curtains, and suddenly you’re in front of 5,000 people,” Hester said. “And you have 45 seconds to walk and trot and canter by the gate, and then what’s the first thing you have to do in the test? Stand still. Carl Hester explains an exercise to student Jade Ellery riding Porsche’s Eloy. Photo by Ann Glavan. It was two parts dressage and one part stand-up show, and given the standing ovation Hester received it’s safe to say the crowd appreciated both performances. No videoing of the event was allowed but the Chronicle was on the ground to catch any and all bits of wisdom Hester had to offer. The first student in the ring was Søren Wind riding 5-year-old gelding Just Perfect. It was a unique opportunity to watch someone with Hester’s level of expertise train a young horse and discuss what he looks for in his young stock and how he measures their progress. Hester started simply, asking Wind to practice shortening and lengthening the horse’s canter on a circle to work on the horse’s contact. 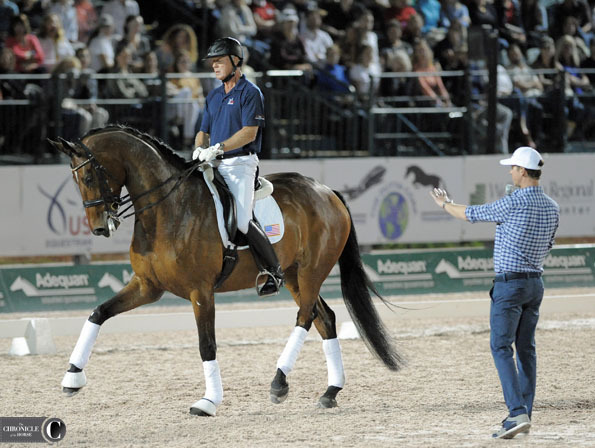 Carl Hester coaches Soren Wind and Just Perfect. Photo by Ann Glavan. This particular horse had a big medium trot, which was great, but Hester wanted the rider to work on the other end of the pace spectrum. Hester spent a good portion of Wind’s lesson getting him to stretch Just Perfect’s pace and frame out longer, lower and more relaxed before collecting it back and stretching again. “This part may seem boring, but you have to do it,” Hester said. “If you remember the word gymnastic you’ll remember you have to stretch and collect to get the elasticity. It’s not just young horses that need to learn to stretch properly—Hester told the trainers in the audience to make their students know how to ride a good stretch as well. Hester also cautioned riders against measuring the success of their young horses by ribbons won in their divisions. Hester said even Valegro struggled with the stretching exercise. In a different lesson, Hester helped a young rider, Rakeya Moussa on Davidoff van het Trichelhof, school flying changes and tempis. Moussa said her horse has a tendency to swing in the changes. “What corrects a crooked change is more forward riding,” Hester said. He directed Moussa to canter on the rail, collect the canter, do a few steps of medium canter followed by a single flying change before collecting the canter and beginning it all over again. Hester directed Moussa to use her whip in tandem with her leg and took the opportunity to explain proper whip usage to the audience. “The whip is not to get the horse going, it’s to get him to react,” Hester said. Most of the lesson was spent in this exercise rather than actually doing tempi changes, and for Hester that’s the whole point. Chase Shipka and Ziggy canter around Carl Hester. Photo by Ann Glavan. 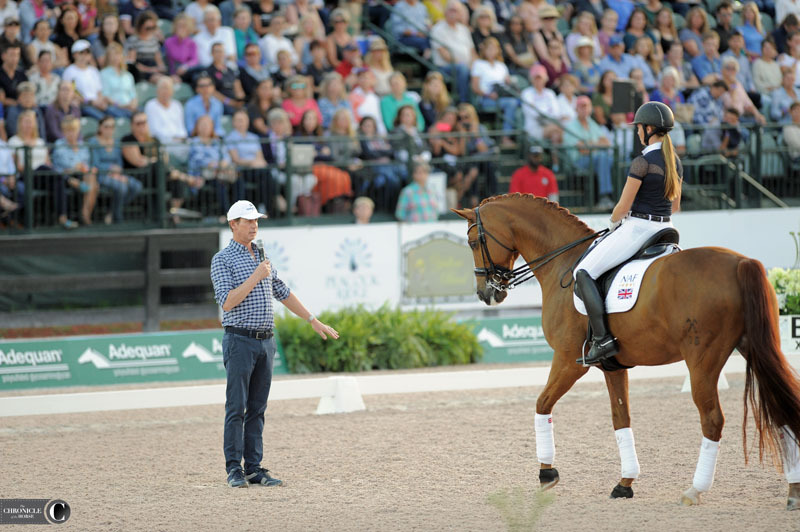 In one lesson Hester reminded Chase Shipka on Ziggy to keep turning in the canter from the outside leg, and he turned to address the audience with a story. “So we told him to canter down the wall and come across the diagonal and do a flying change,” Hester continued. “But when someone rides in the races, they’ve never really put their leg on a horse. He just stands up, gallops like hell and wins everything. Hester also issued a reminder about the inside leg. U.S. Olympian Jan Ebeling rode in the final lesson of the night with Carl Hester aboard Indeed V. Photo by Ann Glavan. Hester doesn’t limit his equine experiences to the world of dressage—he talked about two different bits of advice he’s picked up from other equestrian sports. The first was when he was encouraging a rider, Austin Webster, to help his horse, Abercrombie TF, have a better, swinging walk. First Hester instructed him to encourage the walk from his seat and not all from his lower leg because simply using leg would create a more up and down walk when what the rider needed was a more ground-covering gait. 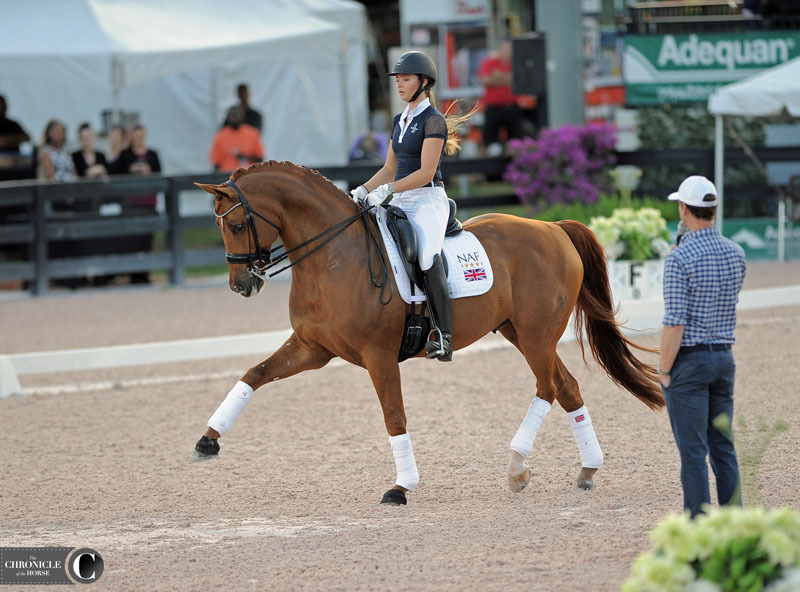 The second lesson Hester picked up from the sport of eventing, and it was a reminder to dressage riders not to school any one movement for a particularly long period of time. Jade Ellery and Porsche’s Eloy show off an extended trot as Carl Hester looks on. Photo by Ann Glavan. We leave you with this final bit of advice from Hester. It came from his lesson with Webster, who was working on the piaffe and passage with his small tour horse. Hester encouraged him to not simply think about the movement he was getting in the moment but rather the movements he could be getting a year from now.